The 2013–14 NHL season was the 97th season of operation (96th season of play) of the National Hockey League (NHL). This season features a realignment of the league's 30 teams from a six to a four division format. The regular season began Tuesday, October 1, and concluded Sunday, April 13. The Stanley Cup playoffs began April 16. The Los Angeles Kings won their second Stanley Cup championship in franchise history (second in three seasons), defeating the New York Rangers four games to one in the Finals. The relocation of the former Atlanta Thrashers franchise to the current Winnipeg Jets in 2011 prompted the league to discuss realignment. On December 5, 2011, the NHL Board of Governors approved a conference realignment plan that would eliminate the current six-division setup and move into a four-conference structure from the 2012–2013 season. Under the plan, which was designed to better accommodate the effects of time zone differences, each team would have played 50 or 54 intra-conference games, depending on whether it was in a seven- or eight-team conference, and two games (home and road) against each non-conference team. On January 6, 2012, the league announced that the NHLPA had rejected the proposed realignment, citing concerns about fairness, travel and the inability to see a draft schedule before approving, and that as a result, it would not implement the realignment until at least 2013–14. Upon NHLPA rejection of the previous realignment, a new joint NHL-NHLPA plan was proposed in February 2013 as a modification of the previous plan with both the Columbus Blue Jackets and Detroit Red Wings moving to the East and the Winnipeg Jets moving to the West. This revised plan also adjusted the previously proposed four-conference system to a four-division/two-conference system, with the Eastern Conference consisting of two eight-team divisions, and the Western Conference consisting of two seven-team divisions. A new playoff format was also introduced to accommodate the new proposal, with the top three teams in each division making the playoffs, along with two wild-cards in each conference (for a total of 16 playoff teams). The NHLPA officially gave its consent to the NHL's proposed realignment plan on March 7, and then the NHL's Board of Governors approved the realignment and the new playoff format on March 14, to be implemented prior to the 2013–14 season. The league then announced the names of the divisions on July 19: the two eight-team divisions in the Eastern Conference would be the Atlantic Division and the Metropolitan Division, and the two seven-team divisions in the Western Conference would be the Central Division and the Pacific Division. The league's Canadian broadcast agreements with CBC and TSN/RDS expired at the end of the season. At the same time, the league had reportedly aimed for its next round of Canadian television contracts to have a value of at least $3.2 billion in total. During negotiations, NHL commissioner Gary Bettman had reportedly recognized the broadcaster's financial difficulties and budget cuts imposed by the federal Conservative government which had decreased CBC's chances of maintaining rights to Hockey Night in Canada and offered CBC a simplified broadcast package which would have consisted of a national doubleheader on Saturday nights (as opposed to regional coverage of multiple games), reduced playoff coverage, and the loss of digital rights and the All-Star Game. Rights to the remaining properties not covered under the CBC's contract would have been offered to other broadcasters. However, CBC Sports' staff, including executive director Jeffrey Orridge, continued to insist that it have exclusivity for every Saturday night game involving Canadian teams. In turn, CBC failed to reach a deal; BCE (owners of Bell Media and previous cable rightsholder TSN and over the air broadcaster, CTV) made a bid for sole national rights to the NHL, and attempted to contact the CBC in regards to forming a partnership. However, CBC Sports' staff did not respond. In turn, Rogers Communications also made a bid of its own. On November 26, 2013, the NHL announced it had sold twelve seasons' worth of exclusive national broadcast rights to NHL games to Rogers, who would broadcast games across its numerous platforms, including Sportsnet, Sportsnet One, and City, at a price of C$5.2 billion. Hockey Night in Canada would continue on the CBC for the next four seasons; the CBC would give Rogers six hours of free airtime each night to air the broadcasts but paid no rights fee. CBC would be allotted time during the broadcasts to promote its other programming. French language broadcasts were moved to TVA Sports under a sub-licensing deal with Rogers. The moves have left both Bell Media (except for its regional properties) and the CBC (which, in turn, would no longer compete with private broadcasters for professional sports) officially shut out of the national NHL broadcasts. All players with fewer than 25 games experience were required to wear visors. The additional minor penalty for instigating a fight when wearing a visor was removed. Players were now assessed an extra minor penalty for unsportsmanlike conduct should they remove their helmet prior to fighting. Jerseys which were not worn properly (such as being tucked in), and other equipment infractions would now result in a minor penalty. The base of the goal frame was now shallower and narrower by 4 inches. The overall width of the base of the frame was reduced from 96 to 88 inches and the depth of the base of the frame was reduced from 44 to 40 inches. Additionally, the corners where the goal post meets the crossbar were bent with a smaller radius, allowing more area across the goal plane. The size of the goal itself remains 6 feet wide and 4 feet tall. The attainable pass exception to the icing rule was removed. Officials would nullify a potential icing only if a player made contact with the puck. Goaltender's equipment was modified. Pads couldn't rise higher on the goaltender's leg than 45 percent of the distance between the center of the knee and pelvis. The pads could rise no higher than nine inches above the knee for goalies with an upper-leg measurement of 20 inches. A new hybrid icing rule was adopted. The hybrid icing rule required officials to stop play immediately in a potential icing situation where, in the judgement of the official, the defender would win a race to the puck ahead of an attacker, and the puck would cross the goal line. The official was to make his judgement when a player gains an imaginary line connecting the end-zone faceoff dots. Note that the first player to gain this imaginary line may not have been the one who would win a race to the puck. The Dallas Stars debuted a new logo, featuring a star with the letter D on it, as well as redesigned uniforms. The green on the uniform was restored as the dominant color, using a brighter shade called "Victory Green," reminiscent of the team before their move to Dallas, thus making the colors easier to distinguish. The Nashville Predators add a slightly tapered gold stripe to the pants and they reverse the color pattern on their road socks. Previously, the color pattern matched that of the ends of the sleeves. The Anaheim Ducks introduced a replica of their inaugural 1993–94 jersey to wear in a regular season game against the Ottawa Senators on October 13. The Anaheim Ducks, Florida Panthers, and Boston Bruins were all wearing special patches to commemorate their first season in the NHL. The Ducks and Panthers were each wearing 20th season patches, and the Bruins were wearing 90th season patches. The Bruins' commemorative patch features six stars which signify the franchise's six Stanley Cup victories. The Carolina Hurricanes debuted a new uniform design that features different striping patterns on the home and away jerseys. The Toronto Maple Leafs and Detroit Red Wings wore specialized jerseys for the 2014 Winter Classic. The Los Angeles Kings and Pittsburgh Penguins retired their third jerseys. The San Jose Sharks modified their home and away jerseys. The Minnesota Wild changed their away jersey. The Buffalo Sabres added a new third jersey, featuring a gold front and navy back. The Calgary Flames retired their throwback third, and added a new third jersey partially inspired by Western wear. The New York Islanders, New York Rangers, Chicago Blackhawks, Pittsburgh Penguins, Los Angeles Kings and Anaheim Ducks each unveiled new jerseys featuring chromed logos for the 2014 Stadium Series. Although the New Jersey Devils also introduced a chromed version of their original red and green logo, they wore their red and green throwback jerseys unaltered (save for a Stadium Series patch) for their Stadium Series game against the Rangers. The Ottawa Senators and Vancouver Canucks wore specialized jerseys for the 2014 Heritage Classic. The Canucks reused the 1915 Vancouver Millionaires design from the previous season, while the Senators wore an off-white version of their black third jersey. With realignment, a new scheduling format was introduced. Among the changes, the scheduling of inter-conference games ensured that all 30 teams would play in all 30 arenas at least once per season. Each team played 82 games – 50 or 54 games within their conference, depending on whether they were in a seven- or eight-team division, and two games (home and road) against each non-conference club. The regular season opened on October 1, 2013, with the first game seeing the Toronto Maple Leafs defeat the home team Montreal Canadiens by a score of 4–3. The annual Christmas trade freeze was in effect from December 20, 2013, through December 26, 2013. There was no all-star game this season, due to the 2014 Winter Olympics in Sochi, Russia. Prior to the season, NHL, International Ice Hockey Federation (IIHF) and Olympic officials reached an agreement to send NHL players to the Olympics game. The league took a break on February 9 and resumed play on February 25. All players participating in their respective national teams gathered in four U.S. airports and flew to Sochi on February 9 and 10. The 2014 NHL Winter Classic was held on January 1, 2014. The game, the sixth Winter Classic, featured the Toronto Maple Leafs and the Detroit Red Wings at Michigan Stadium at the University of Michigan in Ann Arbor, Michigan. The game was originally planned to be played on January 1, 2013, as the 2013 NHL Winter Classic, but was postponed due to the 2012–13 NHL lockout. HBO once again produced a four-part documentary chronicling the preparation of the two teams for the Winter Classic as part of its sports series 24/7 The special also aired in Canada on Sportsnet. The 2014 NHL Heritage Classic featured the Ottawa Senators facing off against the home team Vancouver Canucks at BC Place in Vancouver, British Columbia. This was third Heritage Classic game held in Canada following the Heritage Classic in 2011 when the Calgary Flames defeated the Montreal Canadiens 4–0 at McMahon Stadium in Calgary, Alberta. Unlike previous Heritage Classics, the 2014 event was technically held indoors; BC Place kept its retractable roof closed because of inclement weather. On May 1, 2013, the NHL announced that the Chicago Blackhawks would host the Pittsburgh Penguins at Soldier Field in Chicago on March 1, 2014, as part of the new NHL Stadium Series. The NHL announced an unprecedented six outdoor NHL games for the 2013–14 season: one Winter Classic, four Stadium Series games, and a Heritage Classic game. For the two Stadium Series games they were involved in at Yankee Stadium, the New York Rangers were the away team due to contract obligations with Madison Square Garden as they can't receive income from other venues in New York as the home team (this claim is dubious as Madison Square Garden owns the team and could theoretically waive that clause with its own team at any time). On November 18, 2013, the league announced NHL Revealed: A Season Like No Other, a new seven-part series showing behind-the-scenes footage of top NHL players during the season. The program followed multiple players as they competed in the regular season, the Stadium Series, the Heritage Classic, and the Sochi Olympics. Unlike 24/7, language by players and coaches would be censored. The program aired in the United States on the NBC Sports Network starting on January 22, and in Canada on CBC starting on January 23. The Carolina Hurricanes-Buffalo Sabres game originally scheduled for January 7 was postponed due to the 2014 North American cold wave. It was rescheduled for February 25. The Philadelphia Flyers postponed their game against the Hurricanes from January 21 to 22 due to the city of Philadelphia declaring a snow emergency. This resulted in the Hurricanes postponing their match with the Ottawa Senators from January 24 to 25 due to a rule stating that a team may not play games on three consecutive days. The Dallas Stars postponed their March 10 game versus the Columbus Blue Jackets after Dallas player Rich Peverley, who had a history of heart problems, collapsed while on the players' bench midway through the first period, with Columbus leading 1–0. The game was abandoned at that point. This game was rescheduled for April 9. The game ran for 60 minutes, with Columbus leading 1–0 to start the game with a goal credited to Nathan Horton and assists credited to Matt Calvert and James Wisniewski. All other statistics were expunged. In the rescheduled game, the Blue Jackets won 3–1. This mirrors the actions taken by the league during a game between the Detroit Red Wings and Nashville Predators on November 21, 2005. The following players led the league in regular season points. The following goaltenders led the league in regular season goals against average while playing at least 1800 minutes. In the First Round, the lower seeded wild card in the conference plays against the division winner with the best record while the other wild card plays against the other division winner, and both wild cards are de facto #4 seeds. The other series match the second and third place teams from the divisions. In the first two rounds, home ice advantage is awarded to the team with the better seed; in the last two rounds, it is awarded to the team that had the better regular season record. Beginning in 2013–14, the NHL officially changed the names of the first two rounds of the playoffs from Conference Quarterfinal/Semifinal to First/Second Round. Awards were presented at the NHL Awards ceremony in Las Vegas, Nevada on June 24, 2014. Finalists for voted awards were announced during the playoffs. Voting concluded immediately after the end of the regular season. The Presidents' Trophy, the Prince of Wales Trophy and Clarence S. Campbell Bowl were not presented at the awards ceremony. The Lester Patrick Trophy was announced during the summer and presented in the fall. Daniel Alfredsson Detroit Red Wings Calder Memorial Trophy winner, one-time NHL All-Star, King Clancy Memorial Trophy winner, over 1,200 games played. Todd Bertuzzi Detroit Red Wings 1-time NHL All-Star; over 1,100 games played. Radek Dvorak Carolina Hurricanes Over 1,200 games played. Jean-Sebastien Giguere Colorado Avalanche Conn Smythe Trophy winner, the last active player to have been a member of the Hartford Whalers. Hal Gill Philadelphia Flyers over 1,100 games played. Michal Handzus Chicago Blackhawks over 1,000 games played. Josh Harding Minnesota Wild Bill Masterton Memorial Trophy winner. Ed Jovanovski Florida Panthers over 1,100 games played. Nikolai Khabibulin Chicago Blackhawks Won 333 games. Saku Koivu Anaheim Ducks Bill Masterton Trophy winner; over 1,100 games played. Derek Morris Phoenix Coyotes Over 1,100 games played. Teemu Selanne Anaheim Ducks 4-time NHL All-Star, Bill Masterton Memorial Trophy winner, Calder Memorial Trophy winner, Maurice "Rocket" Richard Trophy winner, over 1400 games played. Ryan Smyth Edmonton Oilers over 1,200 games played. Tim Thomas Dallas Stars 2-time Vezina Trophy winner; Conn Smythe Trophy winner; William M. Jennings Trophy winner; 2-time NHL All-Star. Ray Whitney Dallas Stars over 1,300 games played. On October 2, 2013, the Buffalo Sabres had four people under 20 years old (Mikhail Grigorenko, Zemgus Girgensons, Rasmus Ristolainen and Nikita Zadorov) on their active roster, the most on any NHL team's Opening Night roster since the 1995–96 season. On October 3, 2013, Boston Bruins forward Chris Kelly became the first player in NHL history to score a team's first goal of the season on a penalty shot against the Tampa Bay Lightning at TD Garden. On October 17, 2013, Edmonton Oilers forward Taylor Hall broke Wayne Gretzky's franchise record when he scored twice in eight seconds. Gretzky had held the franchise record for fastest two goals by one player since December 18, 1981, when he scored twice in nine seconds. On October 19, 2013, Phoenix Coyotes goaltender Mike Smith became the 11th goaltender in league history to score a goal when he scored against the Detroit Red Wings. On October 29, 2013, New Jersey Devils forward Jaromir Jagr scored his 119th career game-winning goal, surpassing Phil Esposito's 118 as the most game-winning goals since the 1967 NHL expansion. On November 19, 2013, Tampa Bay Lightning forward Martin St. Louis participated in his 1,000th NHL game. On December 18, 2013, New Jersey Devils forward Jaromir Jagr scored his 122nd career game-winning goal, the most in league history. Gordie Howe held that record dating back to the 1967 season. On December 20, 2013, Washington Capitals forward Alexander Ovechkin scored his 400th career goal. He became the sixth fastest player to reach that mark, getting it in 634 games, one less than Pavel Bure. On December 31, 2013, Anaheim Ducks forward Andrew Cogliano became the 20th player in league history to play 500 consecutive games, and the fifth to do so to start his career. On February 1, 2014, Los Angeles Kings defenseman Robyn Regehr participated in his 1,000th NHL game. On March 1, 2014, New Jersey Devils forward Jaromir Jagr scored his 700th career goal, becoming the seventh player in league history to reach this milestone. On March 3, 2014, Dallas Stars coach Lindy Ruff recorded his 600th career regular season win against his former team the Buffalo Sabres, becoming the 12th coach to reach this milestone. On March 6, 2014, Colorado Avalanche forward Nathan MacKinnon broke one of Wayne Gretzky's records by earning a point in his 13th consecutive game, as the longest point streak by an 18-year-old. Gretzky had held the record for most consecutive points by an 18-year-old since the 1979–80 NHL season. On March 9, 2014, New York Rangers goaltender Henrik Lundqvist recorded his 300th career win, becoming the 29th goaltender to reach this milestone. On March 11, 2014, Minnesota Wild forward Matt Cooke participated in his 1,000th NHL game. On March 12, 2014, Vancouver Canucks forward Henrik Sedin participated in his 1,000th NHL game. On March 18, 2014, New York Rangers goaltender Henrik Lundqvist passed Mike Richter to achieve the most wins in franchise history with his 302nd career victory. On March 19, 2014, Chicago Blackhawks coach Joel Quenneville recorded his 700th career regular season win, becoming the third coach to reach this milestone. On March 19, 2014, Chicago Blackhawks forward Michal Handzus participated in his 1,000th NHL game. On March 20, 2014, Los Angeles Kings coach Darryl Sutter recorded his 500th career regular season win, becoming the 18th coach to reach this milestone. On March 22, 2014, New York Rangers goaltender Henrik Lundqvist passed Eddie Giacomin to become the franchise's all-time shutout leader with his 50th shutout. On March 22, 2014, Los Angeles Kings goaltender Jonathan Quick passed Rogie Vachon to become the franchise's all-time wins leader with his 172nd win. On April 1, 2014, Pittsburgh Penguins captain Sidney Crosby recorded 100 points in a season for the fifth time in his career and first time since the 2009–10 season. On April 8, 2014, Detroit Red Wings coach Mike Babcock recorded his 414th career regular season win, passing Jack Adams for the most in franchise history. On April 10, 2014, Colorado Avalanche goaltender Semyon Varlamov set a franchise record for wins in a season with his 41st victory. He surpassed former goalie and current head coach Patrick Roy's record of 40 set during the 2000–01 NHL season. On April 10, 2014, Nashville Predators goaltender Pekka Rinne passed Tomas Vokoun to become the franchises's all-time wins leader with his 162nd win. On April 11, 2014, the Buffalo Sabres dressed their ninth goaltender of the season, an NHL record (Ryan Miller, Jhonas Enroth, Michal Neuvirth, Nathan Lieuwen, Jaroslav Halak, Matt Hackett, Andrey Makarov, Connor Knapp and Ryan Vinz). On April 11, 2014, Tampa Bay Lightning goaltender Kristers Gudlevskis made his NHL debut thus becoming the first player in history to play in ECHL, AHL, NHL and Olympic Games during one season. On May 13, 2014, New York Rangers center Brad Richards notched his seventh career Game 7 Stanley Cup playoffs win. Consequently, Richards was now 7–0 lifetime in Game 7s, tying former Toronto Maple Leafs defenseman Red Kelly in this league milestone. ^ Rosen, Dan (December 5, 2011). "Governors adopt radical four-conference realignment plan". NHL.com. Retrieved December 5, 2011. ^ NHL realignment on hold after union balks Archived September 18, 2012, at Archive.today. The Sports Network. Retrieved January 6, 2012. ^ NHL Alignment Will NOT Change as NHLPA Rejects Re-alignment. Here's why.... Hockeybuzz.com. Retrieved January 8, 2012. ^ "NHL Realignment Includes Four Divisions, Wild Card Teams". TSN. February 26, 2013. ^ Dan Rosen (March 8, 2013). "Board of Governors Vote Next Step For Realignment Plan". NHL.com. ^ a b Dan Rosen (March 14, 2013). "Realignment plan approved by Board of Governors". NHL.com. ^ Dan Rosen (July 19, 2013). "NHL introduces new division names with schedule". NHL.com. ^ "CBC has much at stake in next NHL television rights negotiation". Toronto: The Globe and Mail. October 11, 2012. Retrieved June 1, 2013. ^ "CBC's Hockey Night in Canada window set to close". Toronto: The Globe and Mail. August 2, 2013. Retrieved November 3, 2013. ^ a b Shoalts, David (October 10, 2014). "Hockey Night in Canada: How CBC lost it all". The Globe and Mail. Toronto. Retrieved October 11, 2014. ^ "Rogers reaches 12-year broadcast deal with NHL worth $5.2-billion". The Globe and Mail. Toronto. November 27, 2013. Retrieved November 26, 2013. ^ "CBC to cut 657 jobs, will no longer compete for professional sports rights". CBC News. April 10, 2014. Retrieved April 10, 2014. ^ a b Hybrid icing tops list of rule changes for 2013-14. NHL.com Retrieved September 30, 2013. 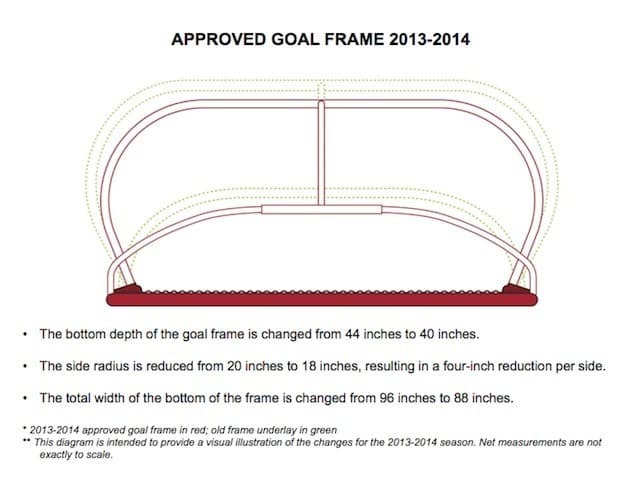 ^ "Approved Goal Frame 2013-14". Retrieved April 8, 2014. ^ "Behind The Scenes: The Creation of the Stars' New Logo and Uniforms". NHL.com. June 4, 2013. Retrieved June 5, 2013. ^ "Hurricanes Introduce New Home and Road Uniforms". NHL.com. June 4, 2013. Retrieved June 5, 2013. ^ "NHL Hockey Schedule for September 26, 2013 to October 3, 2013 - NHL.com - Schedule". NHL.com. Retrieved April 8, 2014. ^ "NHL roster freeze kicks in at midnight | For The Win". Ftw.usatoday.com. December 19, 2013. Retrieved April 8, 2014. ^ "Red Wings, Maple Leafs to meet in 2014 NHL Winter Classic". CBC Sports. April 7, 2013. Retrieved April 7, 2013. ^ "24/7 on HBO to feature 2014 NHL Winter Classic, Detroit Red Wings, Toronto Maple Leafs - Bridgestone NHL Winter Classic - Maple Leafs vs. Red Wings". Nhl.com. Retrieved April 8, 2014. ^ "Hawks to host Pens outside as part of 'Stadium Series'". National Hockey League. May 1, 2013. Retrieved May 1, 2013. ^ "Dodger Stadium to host Los Angeles Kings, Anaheim Ducks in January – NHL.com – News". NHL.com. Retrieved July 3, 2013. ^ a b "Stadium Series New York event to feature Islanders, Devils and Rangers at Yankee Stadium – NHL.com – News". NHL.com. Retrieved July 3, 2013. ^ a b "Blackhawks to host Penguins outdoors as part of Stadium Series – NHL.com – News". NHL.com. Retrieved July 3, 2013. ^ Blackburn, Pete. "NHL announces behind-the-scenes documentary series following star players". The Nosebleeds. Retrieved April 8, 2014. ^ "Game between Carolina Hurricanes, Buffalo Sabres rescheduled for Feb. 25 - NHL.com - News". NHL.com. Retrieved April 8, 2014. ^ "Postponed Dallas Stars-Columbus Blue Jackets game rescheduled for April 9 - NHL.com - News". NHL.com. Retrieved April 8, 2014. ^ a b c "2013–2014 Wild Card Standings". National Hockey League. Retrieved December 23, 2013. ^ "Player Stats: 2013–2014 Regular season: All Skaters – Total Points". National Hockey League. ^ "2013–2014 - Regular season: Goalie – GAA leaders". National Hockey League. ^ 2016 NHL Guide and Record Book. National Hockey League. 2015. ^ "Stanley Cup Playoffs". NHL.com. NHL Enterprise, L.P. Retrieved May 12, 2016. ^ "Bertuzzi catches the coaching bug". The Peterborough Examiner. ^ |- "Oilers' Smyth, 'Captain Canada,' set to retire". April 11, 2014. Retrieved April 11, 2014. ^ "@PR_NHL status update". Twitter. Retrieved October 20, 2013. ^ "Hall breaks Oilers team record for fastest two goals". National Hockey League. October 17, 2013. Retrieved October 18, 2013. ^ "Detroit Red Wings at Phoenix Coyotes". National Hockey League. October 19, 2013. ^ "Jagr sets modern record with 119th GWG, Devils top Lightning". The Sports Network. October 29, 2013. ^ Gordie Howe held the record for most game-winning goals in league history with 121 until 2013. ^ "Martin St. Louis Skates In 1,000th Career NHL Game". Tampa Bay Lightning. November 19, 2013. ^ "Ottawa Senators at New Jersey Devils". National Hockey League. December 18, 2013. ^ "Alex Ovechkin scores 400th career goal, Washington Capitals score 3 times on power play in 4-2 win over - NHL.com - News". NHL.com. December 20, 2013. Retrieved April 8, 2014. ^ "Postgame Notes and Quotes: Dec. 31 vs. SJ". Anaheim Ducks. Retrieved January 1, 2014. ^ "Philadelphia Flyers at Los Angeles Kings Game Recap". Los Angeles Kings. February 1, 2014. ^ "New Jersey Devils at New York Islanders". National Hockey League. March 1, 2014. ^ "Buffalo Sabres at Dallas Stars". National Hockey League. March 3, 2014. ^ "MacKinnon breaks Gretzky's point-streak record". National Hockey League. March 6, 2014. Retrieved March 7, 2014. ^ "Detroit Red Wings at New York Rangers". National Hockey League. March 9, 2014. ^ "Edmonton Oilers at Minnesota Wild". Minnesota Wild. March 11, 2014. ^ "Vancouver Canucks at Winnipeg Jets". National Hockey League. March 12, 2014. ^ "Henrik Sets Wins Record as Rangers Big Second Powers 8-4 Victory". New York Rangers. March 19, 2014. ^ a b "St. Louis Blues at Chicago Blackhawks". Chicago Blackhawks. March 19, 2014. ^ "Washington Capitals at Los Angeles Kings". Los Angeles Kings. March 20, 2014. ^ "Lundqvist sets Rangers record with shutout of Devils". National Hockey League. March 23, 2014. ^ "Quick uses shutout to set Kings' victory mark". National Hockey League. March 23, 2014. ^ "Red Wings top Sabres, close in on playoffs". National Hockey League. April 9, 2014. ^ "Avalanche hold Central lead after win vs. Canucks". National Hockey League. April 11, 2014. ^ "Coyotes' playoff chances hurt by Rinne, Predators". National Hockey League. April 10, 2014. ^ Hoppe, Bill (April 11, 2014). Sabres recall goalie Connor Knapp from Amerks. Olean Times Herald. Retrieved April 11, 2014. ^ MORNING SKATE: STANLEY CUP PLAYOFFS EDITION (May 14, 2014). . Sports Talk Florida. Retrieved May 14, 2014.